Baigujing (Chinese: 白骨精; pinyin: Báigǔjīng) is a demon from the novel Journey to the West. The name is translated into English as White Bone Spirit in the William John Francis Jenner translation. Baigujing is a shapeshifting demoness, and in her true form she is depicted as a skeleton. Baigujing was a demon who desired to eat the flesh of Tang Sanzang. She disguised herself as a village girl and offered him and his disciples poisonous fruits. Due to her strong powers, only Sun Wukong could detect that she was a demon. He hit her with his staff, seemingly killing her. Sun Wukong tried to explain to everyone what she was but they didn't believe him. Tang Sanzang believed she was an innocent and buried her. Having survived the attack, she dug underground to recover. She returned a second time disguised as an elderly woman. She lied to the group, causing them to believe that the village girl from earlier was her daughter. Sun Wukong sees through her disguise once again and kills her. The group is angered at Sun Wukong and continues to not believe him. She returns a third time as an elderly man who lies about having a daughter and wife. The group immediately felt guilty as they believed they are the two women Sun Wukong had slain. She taunts Sun Wukong into attacking her by using his powers, and only he could hear her. Having a short-temper, he finally beats her with his staff and kills the demon, revealing that she was just a skeleton spirit. 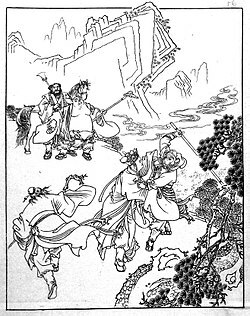 Sun Wukong shows this to Tang Sanzang, who initially believes him, but Zhu Bajie convinces Tang Sanzang that Sun Wukong transformed the corpse into a skeleton to evade the Band-tightening spell. Tang Sanzang is angry at Sun Wukong at his reckless slaying and scolds him. He cuts his ties with Sun Wukong and sends him away. Hurt by his master's words, Sun Wukong leaves and returns to Water Curtain Cave. In his absence, Tang Sanzang gets caught by another demon—Yellow Robe Demon that Zhu Bajie and Sha Wujing cannot defeat, and Zhu Bajie is forced to apologize to Sun Wukong and invite him back to save Tang Sanzang. ^ a b Wu Cheng-en: Journey to the West, chapter 27. This page was last edited on 1 March 2018, at 15:38 (UTC).